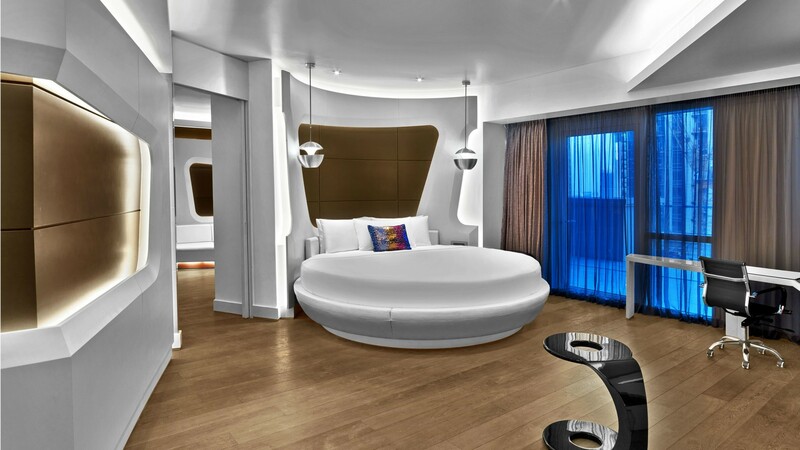 With its luxe, futuristic aesthetic, V Hotel captures Dubai’s extravagant vibe. 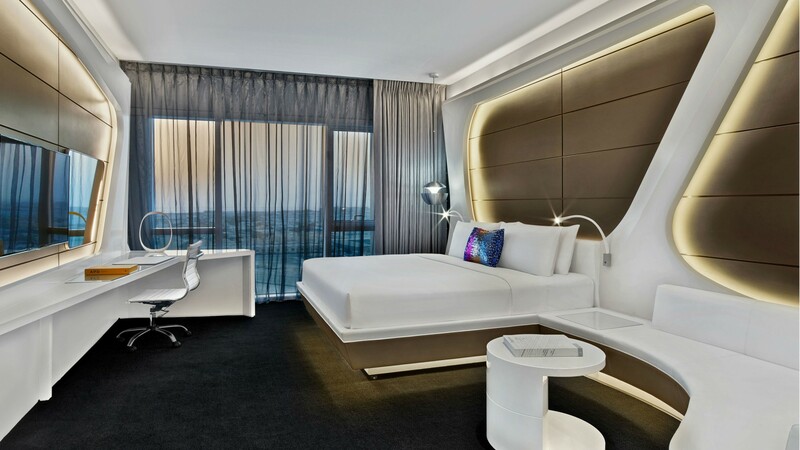 Over-the-top and ultra-modern, V Hotel is the kind of property that could only exist in an equally ostentatious destination like Dubai. Move along if clean lines and minimalism are your thing, because staying at this hotel feels like being on the inside of splashy spaceship bound for the planet funk. Guests enter via a club-like lobby with bold striped patterns running from floor-to-ceiling, but actual check-in takes place in a more restrained reception area on the 30th floor, which has nice views over the Dubai Water Canal. Part of the Curio Collection by Hilton, the 356-room hotel attracts guests that are as flashy as its rooms and spaces. With curving white accent panelling, glowing back-lighting and starburst-patterned artwork, rooms extend the hotel’s I’m-travelling-in-a-spaceship vibe. We stayed in one of the King Deluxe Rooms, the most basic room category, which come with a small sitting area, a work desk 48-inch HDTV and free Wi-Fi. Rooms have an open concept layout, with the bedroom flowing into a moody, black-tiled bathroom with a sink, a deep bathtub, and an enclosed walk-in shower and separate WC. Pricier suites come with additional spaces like living rooms, dining areas, kitchenettes, or even a DJ booth, but the standard room was more than spacious enough for one or two people. Easily the hotel’s most unique feature is a 1,300-seat theatre, custom-built to host La Perle, a water-themed show from the creators of Cirque du Soleil. The high-drama show features real cascading waterfalls, crazy 25-metre high dives into pools of water and Cirque-esque acrobatics. 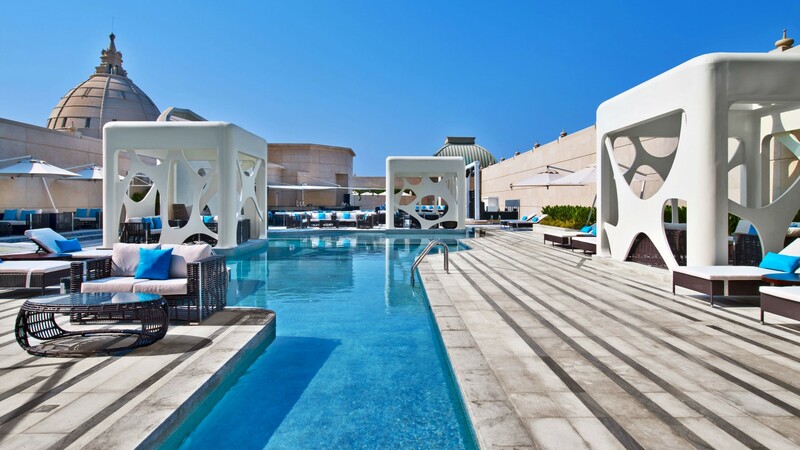 The glitzy outdoor pool deck has a DJ booth, bar and lots of cushy loungers and geometric-patterned cabanas. The pool is better suited to preening than swimming laps, so head to V Gym, which has a solid range of cardio and strength training equipment, if you’re looking for a work-out. The upper floors of the hotel are home to a two-storey nightclub, a Korean restaurant and a lounge, all of which have good views over the city. Mediterranean restaurant Level Seven rounds out the dining and drinking options. V Hotel is located in Al Habtoor City, a mixed-use development located across from the Dubai Water Canal, just off busy Sheikh Zayed Road. The hotel connects with the two neighbouring properties, Habtoor Palace, LXR Hotels & Resorts and Hilton Dubai Al Habtoor City, with dozens of dining options available between the three hotels. Otherwise, there aren’t many attractions within walking distance, so be prepared to take Ubers and taxis to explore the city. It’s about a 10-minute drive to downtown Dubai and attractions like the Burj Khalifa, while the airport is under a 20-minute drive away.